Organized by The Marwar Festival is held every year in memory of the heroes of Rajasthan. The festival is held in the month of Ashwin (September-October) in Jodhpur, for two days during the full moon of Sharad Poornima. 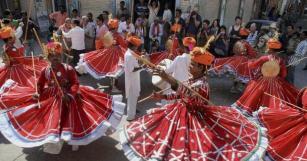 The Department of Tourism, Government of Rajasthan, the Marwar Festival was originally known as the Maand Festival. Maand is a classical style of folk music centered on the romantic life style of Rajasthan's rulers, and Maand Raag recreates the old world charm and graceful dances of the desert. Held for two days during the full moon, Sharad Purnima, in October it is celebrated mainly in Jodhpur. Folk artists bring to life the inspiring mythologies, folk stories, tales and legends of battles, war victories and valor. Other attractions at the festival are the camel tattoo show and polo. The impressive Umaid Bhawan Palace, Mandore and Mehrangarh fort, which are symbols of might and valour, provide the ideal venue for the cultural extravaganza – an integral part of the festival.